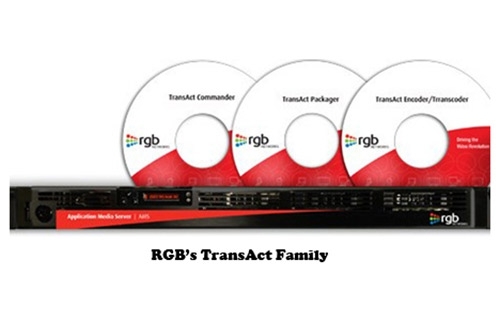 RGB Networks, the leading provider of the industry’s most scalable and unified solutions for multiscreen video delivery, has announced that it is developing an open source version of its popular TransAct Transcoder. Called ‘Ripcode Transcoder’, after the company Ripcode, which was acquired by RGB Networks in 2010 and which originally developed TransAct, the new, cloud-enabled software transcoder will provide RGB Networks’ customers with greater control, integration and flexibility in their video delivery workflows. In a pioneering move, and harnessing the industry momentum toward developing cloud-based solutions, RGB Networks is actively welcoming operators and vendors to be part of a community of contributors to the open source project. RGB Networks’ CloudXtream solution for nDVR and dynamic Ad Insertion for Multiscreen (AIM) environments, launched in October 2013 and built on the industry standard open source cloud operating system OpenStack, has paved the way for this latest innovation. The company intends to build on this success with Ripcode, which will be an «open core» project, where the core technology from the TransAct Transcoder is being used to create the foundations of the open source project. Suitable for a variety of applications, the Ripcode Transcoder will include the full feature set expected of an industrial-strength, professional transcoder, leaving customers open to select and integrate the packaging solution of their choice necessary to produce their desired Adaptive Bit Rate output formats. The release of the first version of Ripcode Transcoder — 1.0 — with all the appropriate licensing is targeted for Q1 2015. RGB Networks provides the industry’s most scalable, unified solutions for multiscreen video delivery to any device. With core strengths in nDVR, ad insertion, packaging, and transcoding, RGB’s ‘Multiscreen 2.0’ cloud-based solutions enable video service providers to streamline and monetize TV Everywhere and OTT services, with unmatched reliability and future-proof scalability. RGB’s high-capacity cloud, software, and hardware solutions uniquely offer the density and scalability required to support the growing demand for video delivery to TVs, tablets, PCs and mobile devices with integrated functionality that simplifies service provider’s network architectures and minimizes operational costs. RGB’s award-winning products are deployed with over 400 video service providers worldwide, delivering solutions for traditional and OTT video services. Venture capital investment firms include Accel Partners, Comcast Interactive, Focus Ventures, Granite Ventures, Institutional Venture Partners, Kleiner Perkins Caufield and Byers, and Mitsui & Co. Venture Partners. RGB is a private, profitable company based in Sunnyvale, California with offices around the world. Beamr is an imaging technology company that works with the world’s leading web publishers, social networks and media companies to enable optimal user experiences across any user device or platform. Led by serial entrepreneurs and technology experts with extensive experience in media compression and delivery, Beamr’s goal is to improve the user experience and reduce the costs associated with storing and transmitting media files through its JPEGmini and Beamr Video products. Beamr Video’s patent-pending technology enables smoother streaming experiences by cutting video bitrate by up to 50 percent without compromising quality, while significantly reducing video delivery costs for distributors. For more information, visitwww.beamrvideo.com. DivX, LLC is leading the way to better, more seamless consumer video experience by powering the professional creation, protected distribution and high-quality playback of highly efficient video to multiple devices and platforms. DivX, along with its subsidiary MainConcept, offers service providers, device manufacturers and integrators technologies that address the entire video supply chain with solutions for software applications, OTT content services and consumer electronics devices. Over 1 billion DivX enabled devices have shipped worldwide from major manufacturers and DivX consumer software products have been downloaded over 1 billion times. DivX is based in San Diego, CA, with offices across Europe and Asia. For more information on the company, visit www.divx.com/company. Founded by Industry veterans in November 2009, eBrisk Video is a leading developer of intellectual property in the area of video compression algorithms as well as a leading provider of H.265/HEVC video compression software solutions for video conferencing and broadcast/streaming applications. The company’s H.265/HEVC solutions are designed to improve substantially the visual experience of video conferencing and broadcast/streaming applications on current platforms over existing networks. eBrisk Video’s full-featured real-time H.265/HEVC encoding solutions feature the best video quality and the highest density in the market. When it comes to innovative audio technologies for the rapidly evolving media world, Fraunhofer IIS stands alone. For more than 25 years, digital audio technology has been the principal focus of the Audio and Multimedia division of the Fraunhofer Institute for Integrated Circuits IIS. From the creation of mp3 and the co-development of the AAC to the future of audio entertainment for broadcast, Fraunhofer IIS brings innovations in sound to reality. Today, technologies such as Fraunhofer Cingo for virtual surround sound, Fraunhofer Symphoria for automotive 3D audio, AAC-ELD for telephone calls with CD-like audio quality, and Dialogue Enhancement that allows television viewers to adjust dialogue volume to suit their personal preferences are among the division’s most compelling new developments. Fraunhofer IIS technologies enable more than 7 billion devices worldwide. The audio codec software and application-specific customizations are licensed to more than 1,000 companies. The division’s mp3 and AAC audio codecs are now ubiquitous in mobile multimedia systems. Fraunhofer IIS is based in Erlangen, Germany and is a division of Fraunhofer-Gesellschaft. With more than 23,000 employees worldwide, Fraunhofer-Gesellschaft is comprised of 67 institutes and research units making it Europe’s largest application-oriented research organization. Ittiam Systems Private Limited, headquartered in Bangalore, India, is a technology company focused on providing cutting edge multimedia solutions for a wide range of products as well as cloud services. With its wide range of components, SDK’s, applications, hardware platforms, turnkey systems and cloud based workflows, Ittiam offers solutions to automotive, broadcast, consumer and mobility as well as industrial and defense markets. Embedding Ittiam IP inside, annual volume of customers’ products shipped is in several tens of millions units. MulticoreWare, Inc. is a leading provider of high performance video processing software libraries including the x265 HEVC encoder, UHDcode HEVC decoder, GPU accelerated Video Processing Library and GPU accelerated VP9 decoders. MulticoreWare’s parallel computing tools, libraries and expertise in heterogeneous computing forms the foundation of a worldwide professional services business, with more than 200 engineers in 6 locations. For more information, please visit www.multicorewareinc.com. Squid Systems, Inc. is a global innovator in video compression and image processing technology, with industry-leading HEVC algorithms that produce better visual quality at any bit rate, and deeper compression at any level of visual quality. Squid provides software products and hardware IP for customer deployment of H.265 HEVC video encoding and decoding. The company has its headquarters in California’s Silicon Valley with R&D facilities in Hyderabad, India. Founded in 1995, Vanguard Video is a supplier of professional, broadcast quality H.265/HEVC and H.264 codec SDKs to top tier customers around the world. With deep codec expertise, unparalleled performance and quality, and world class support, Vanguard Video has helped its customers capitalize on many first to market opportunities by pioneering top tier encoding solutions including the release of the world’s first commercially deployed H.265/HEVC service. Vanguard Video codecs support a wide range of platforms including software implementations for x86 and ARM microprocessors, OpenCL acceleration for GPUs, and IP Cores for FPGA devices. For more information, please visit www.vanguardvideo.com.